Fan filters do not only keep the system clean, they are also optically very appealing. Phobya tackles an old problem, dust, with revised technology. This filter highly effectively removes dust from the air passing through it. The unit consists of 3 pieces for easy maintenance and cleaning. The first part, the front, features a clean and straightforward design without visible screws. This part protects the system from large pieces which could be sucked in. Another positive effect is that the front frame prevents possible injury from the fan blades. The front frame can be removed and is connected to the back piece with a clip-in system. The rear is the counter piece to the front frame, which fixate the filter itself. The rear piece also features the practical and good-looking hexagonal mesh design of the front frame, safely holding the filter unit in place. The rear also holds the mounting screws which are completely covered and invisible when the filter is assembled. The middle piece is the filter itself. Fine enough to keep even the smallest particles out of your system, but coarse enough to not obstruct the airflow significantly. The filter unit can be removed completely, hence making cleaning quick and easy. 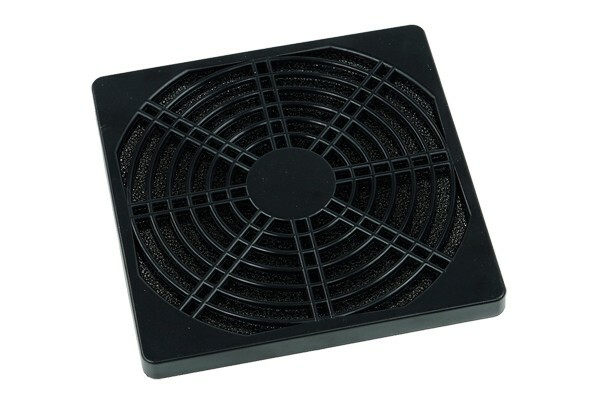 This filter is a bit larger than the 120mm fan to avoid obstruction of air flow. When mounting the filter on radidators it hence does not fit at first. For mounting on radiators the sides of the filters must be shaved down to allow side-by.-side mounting.